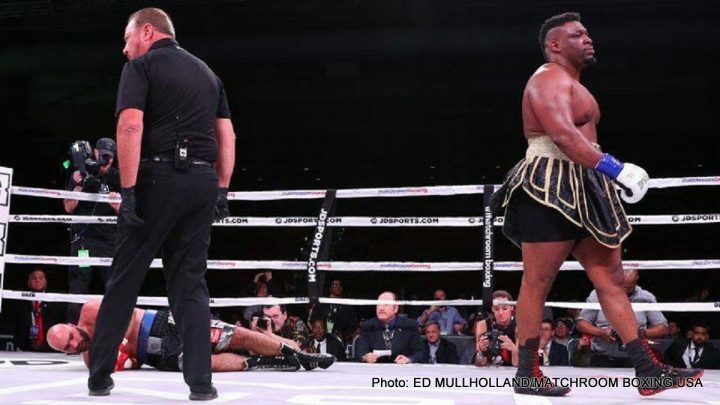 By Mike Smith: Promoter Eddie Hearn plans on having unbeaten heavyweight contender Jarrell ‘Big Baby’ Miller (23-0-1, 20 KOs) back inside the ring next month in a headliner bout against an opponent still to be determined on a DAZN card in New York on January 18, according to Mike Coppinger. There’s also a possibility WBO middleweight champion Demetrius ‘Boo Boo’ Andrade could be the one headlining the card. Hearn is expected to make an announcement soon about the January 18 card on DAZN. Having the Miller and/or Andrade DAZN fight card on Friday, January 18, it will keep the card from being overlooked by boxing fans, as on January 19 the Manny Pacquiao vs. Adrien Broner fight will be taking place. Hearn recently signed the 6’4″ 315 lb Miller to his Matchroom Boxing USA-DAZN stable, and he’s been keeping him incredibly busy. In 2018 alone, Miller has fought three times, beating Johann Duhaupas, Tomasz Adamek and Bogdan Dinu. Hearn’s rationale for keeping the New Yorker Miller busy is to build up his popularity quickly in the United States and the UK in order to create interest in a fight between him and IBF/WBA/WBO heavyweight champion Anthony Joshua (22-0, 21 KOs), who Eddie also promotes. Hearn is being careful with the type of fighters he puts Miller in with. He’s not throwing him in with guys that could potentially beat him like Luis ‘King Kong’ Ortiz or Joe Joyce. Hearn is being careful in matching Miller against older fighters like 41-year-old Tomasz Adamek, 37-year-old Duhaupas and 33-year-old Dinu. In the case of Dinu, he’s not old, but he’s not one of the best fighters in the division. In other words, Hearn matched Miller against a guy that he could beat with a high degree of certainty. In other boxing news, WBO junior middleweight champion Jaime Munguia (31-0, 26 KOs) was a guest of Premier Boxing Champions last Saturday night for the Deontay Wilder vs. Tyson Fury card, according to Coppinger. Munguia, 22, is currently promoted by Zanfer Promotions and co-promoted by Golden Boy Promotions. Eric Gomez, the president of Golden Boy, told Coppinger that he’s not concerned about it due to Munguia being under contract with them. It’s unclear how long Golden Boy has Munguia signed for. If it’s not long, it could be an opportunity for PBC to sign a co-promotional deal in the near future with the exiting Mexican star. Once Munguia is a free agent, it’ll be fair game for other companies to try and put together a deal with him. Munguia will be defending his WBO 154 lb title next month against Takeshi Inoue (13-0-1, 7 KOs) on January 26 in Houston, Texas. This will be Munguia’s third defense of his World Boxing Organization junior middleweight title he won last May in stopping former WBO belt hold Sadam Ali in the 4th round. Munguia has since defended the belt twice in beating Liam Smith and Brandon Cook. Former IBF/WBA/WBC middleweight champion Gennady Golovkin’s promoter Tom Loeffler didn’t attend his meetings with PBC last Saturday or his meetings with John Skipper of DAZN, according to Coppinger. It’s unclear what’s going on with Loeffler for him not to be sitting in on those meetings. Loeffler has been with GGG for many years now. The question now is will Golovkin be moving to a different promoter? GGG is still looking for a network or streaming company to sign with now that his contract with HBO is up. He’s met with ESPN/Top Rank, DAZN and Premier Boxing Champions. It’s still possible that Golovkin will continue to work with Loeffler. Golovkin has been with Loeffler all these years. It’s difficult to imagine him moving to a different promoter. Many fans expect the 36-year-old Golovkin to ultimately ink with DAZN in order for him to get a third fight against Saul Canelo Alvarez. Whoever GGG signs with, he’s likely going to be limiting himself to the fighters that are signed with that streaming service or network. Signing with DAZN makes sense for Golovkin if he wants to make a lot of money fighting Canelo again, but there’s not a lot of great options for him to fight aside from him. The other options for GGG aren’t great as well if he signs with ESPN or PBC. Wherever GGG goes, nothing will be perfect. He’ll have to take the bad with the good and try and make the best of it with the limited choices he’ll have for opposition. Golovkin (38-1-1, 34 KOs) wants to avenge his loss to Canelo Alvarez from last September. He suffered his first career defeat in losing by a 12 round majority decision in Las Vegas, Nevada. While some boxing fans think GGG should have won, a lot of them didn’t. Golovkin got hit a lot in the fight by Canelo, and he uncharacteristically was backing away from the young Mexican star instead of coming forward all night. It was a mistake on GGG’s part to back up, but he was taking a lot of punishment. Golovkin lacked the hand speed, work rate and the defensive skills to get the better of Canelo when he did fight stationary.